This website uses Google Analytics, a web analytics service provided by Google Inc. (“Google”). Google Analytics uses so-called “cookies”, text files that are stored on your computer and that allow an analysis of the use of the website by you. The information generated by the cookie about your use of this website is usually transmitted to a Google server in the USA and stored there. However, if IP anonymisation is activated on this website, your IP address will be shortened by Google beforehand within member states of the European Union or other parties to the Agreement on the European Economic Area. Only in exceptional cases will the full IP address be sent to a Google server in the US and shortened there. On behalf of the operator of this website, Google will use this information to evaluate your use of the website, to compile reports on website activity and to provide other services related to website activity and internet usage to the website operator. The IP address provided by Google Analytics as part of Google Analytics will not be merged with other Google data. You can prevent the storage of cookies by a corresponding setting of your browser software; however, please note that if you do this, you may not be able to use all the features of this website to the fullest extent possible. In addition, you may prevent the collection by Google of the data generated by the cookie and related to your use of the website (including your IP address) as well as the processing of this data by Google by downloading the browser plug-in available under the following link and install [The current link is http://tools.google.com/dlpage/gaoptout?hl=en]. The author hereby expressly declares that at the time of linking, no illegal content was recognizable on the linked pages. The author has no influence on the current and future design, content or authorship of the linked pages. Therefore he dissociates himself hereby expressly from all contents of all linked / linked sides, which were changed after the link setting. This statement applies to all links and references within the own Internet offer as well as to foreign entries in guest books, discussion forums, link directories, mailing lists and in all other forms of databases on whose contents external writing accesses are possible. For illegal, incorrect or incomplete contents and in particular for damages resulting from the use or non-use of such information, the provider of the page to which reference has been made, not the one who only links to the respective publication. The author endeavors to observe the copyrights of the images, graphics, sound documents, video sequences and texts used in all publications, to use images, graphics, sound documents, video sequences and texts created by himself or to resort to license-free graphics, sound documents, video sequences and texts , All brand names and trademarks mentioned within the Internet offer and possibly protected by third parties are subject without restriction to the provisions of the applicable trademark law and the ownership rights of the respective registered owners. Just because of the mere mention is not to draw the conclusion that trademarks are not protected by rights of third parties! If within the Internet offer the possibility for the input of personal or business data (email addresses, names, addresses) exists, the surrender of these data on the part of the user on expressly voluntary basis. By specifying his postal address or e-mail address, the user agrees (revocably) to receive ordered information material (newsletter, postal mail) from us by post and / or e-mail. The use and payment of all offered services is – as far as technically possible and reasonable – also without specification of such data or under specification of anonymized data or a pseudonym allowed. The use of the contact data published in the imprint or comparable information such as postal addresses, telephone and fax numbers as well as email addresses by third parties for the transmission of not expressly requested information is not permitted. Legal action against the senders of so-called spam mails for violations of this prohibition are expressly reserved. For stylistic reasons and for reasons of easier readability, the male form was used in the description of persons – but always meant women and men. 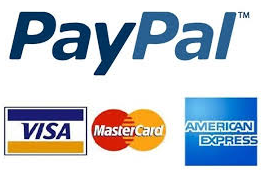 in our shop you can order and pay comfortably and secure.